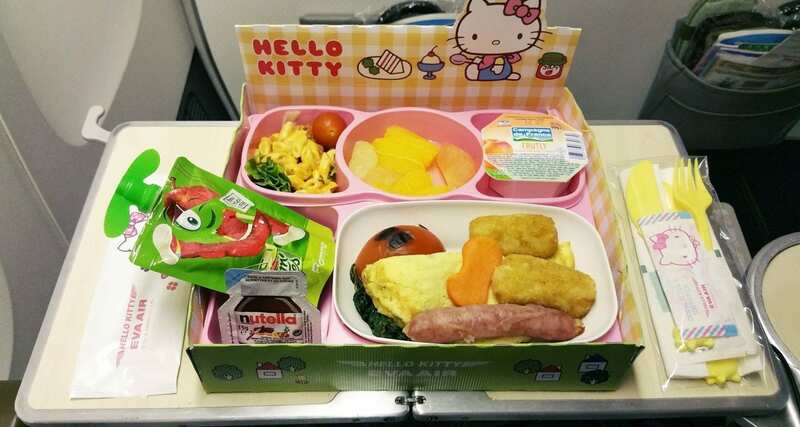 Get ready to see some seriously excellent inflight meals offered to children on the Hello Kitty Jets of Eva Air! This kids meal was one of my most liked pictures on Instagram ever, and you can see from below why! While it was a little embarrassing for this grown man to be served these inflight meals, in the end, I didn’t care what the people near me thought of me. It’s all part of the research for this website, and I’ll never see them again anyway. 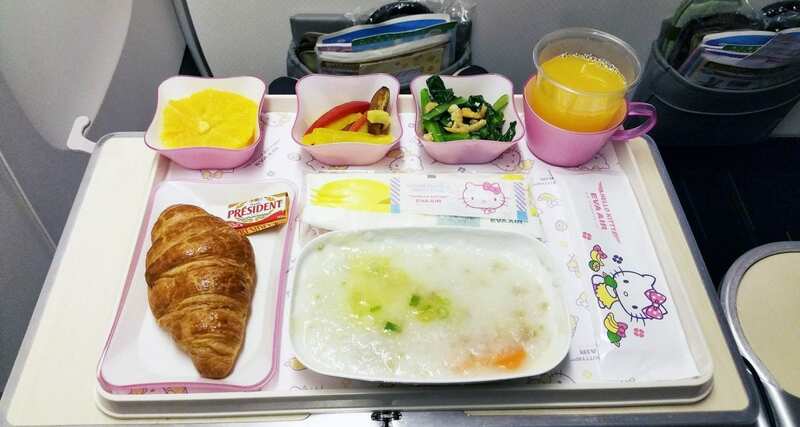 Now remember these meals are generally not served to adults, they are strictly for kids, and it was a particular order that I had to place with a contact that I know at Eva Air Catering (and their PR team! Thx). You may find it difficult to order these if you’re an adult, but if you have kids travelling with you, I highly recommend ordering these quirky and fun meals. I think I can safely say that these meals are some of the most fun and colourful that I have ever experienced inflight. The Hello Kitty Jets run on various city pairs throughout the world, on this particular sector I was flying from Paris to Taipei (and then onto Tokyo and Hawaii) and I was lucky enough to have booked a flight on the Hello Kitty Jet. If you would like more information on these flights head over to the Eva Air Hello Kitty Jet website right here. A few years back I flew the very first HK Jet from Paris to Taipei, and you can check out that review right here. I was flying in premium economy, and therefore the menu offerings are of a better standard that economy class. Before the meal service, the cabin crew distributed inflight menus, and pre-meal drinks. Yes, even the sick bag is covered in Hello Kitty’s face! Pre-meal drink and snack: Soda water and mixed nuts, notice the Hello Kitty napkin too? Main meal options for this daytime flight included: Tomato Mozzarella salad with shrimps with a choice of Salt and Pepper Chicken or Green Curry Fish with pasta. Both meals were served with fruit and ice cream from Haagen Dazs. But the real highlight of the first meal service was the delivery of my Hello Kitty kids meal. What a great looking meal tray, spaghetti with meatballs, potato salad, fresh fruit, chocolate brownie, crackers and juice. So much food for a child! I ended up eating this meal first and then sampled the ‘normal’ menu afterwards. I always find the catering ex Paris to be of high quality, and all the meals served by Eva on this flight were delicious indeed. As always the crew were still on hand to offer water and juice throughout the flight, and there were snacks available to eat if you felt hungry. Before landing in Taipei breakfast was served, and the choices included a Chinese or Western style offering of Tofu with Zucchini Cube, Dried shrimps with Choysam, Beef Congee and Fruit or A pancake with mornay sauce with pork sausage and potato cake. I also had an option for my second Hello Kitty Kids meal. Beef congee, quite a delicious meal. Hello Kitty Breakfast – Omelette, sausage, tomato with fresh fruit, noodle salad and yoghurt. The Hello Kitty Jet experience is undoubtedly one of the happiest flights you will ever take. I highly recommend experiencing one of these flights if you can, sure it might be a little over the top, but it’s a lot of fun. If you’re a collector of things, you should ask the cabin crew for any HK branded items, if you’re lucky you might get some playing cards or something else.